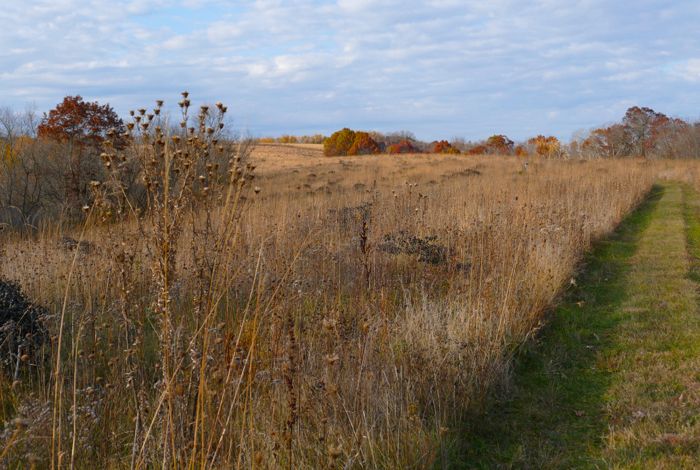 Our landscape is mostly brown and yellow now – it’s almost winter. We actually had a little snow a few nights ago. It coated the roof of the house and the willow leaves near the porch door, but disappeared before the sun came up. We had a couple of really nice visits recently. 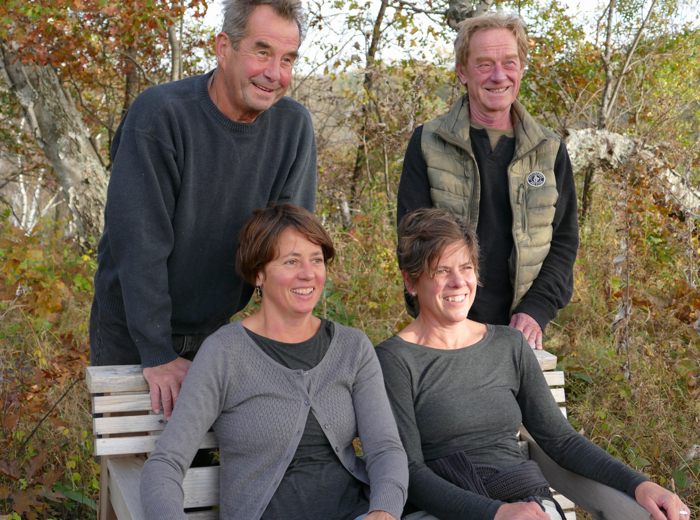 And Margaret and Steve Rutschow – who grew up on our farm – came by to see it again, and to show us old photos of the way it used to look. 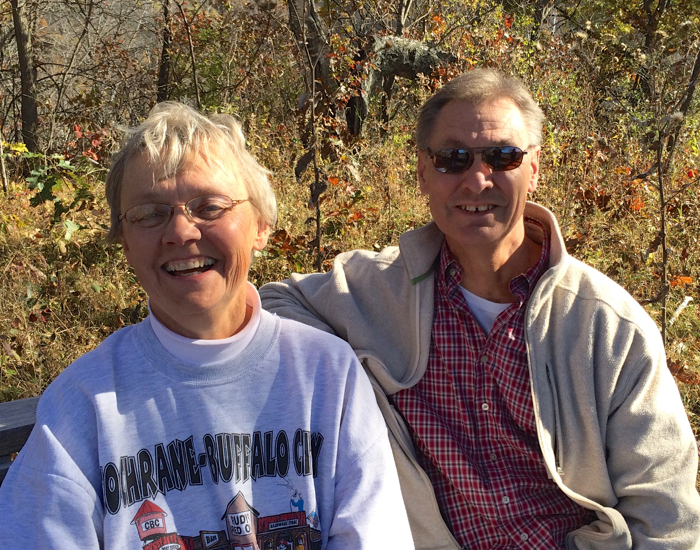 Here are Margaret and Steve on one of our benches. This is a photo that Steve brought, that was taken in the summer of 1946. 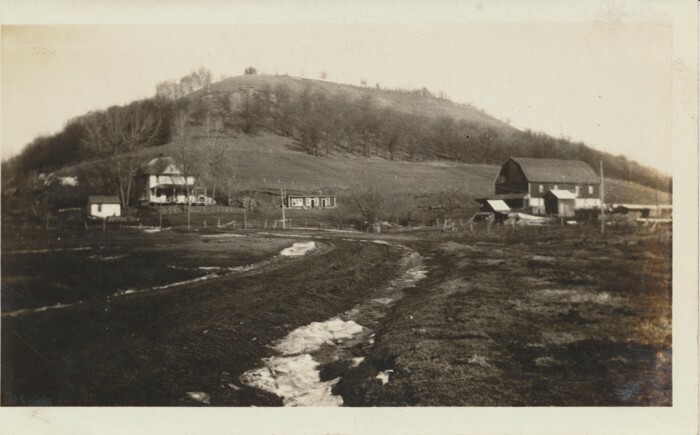 The old farm house – the one they grew up living in – is behind the trees. The bluff behind the barn is the one we call Sumac Bluff. 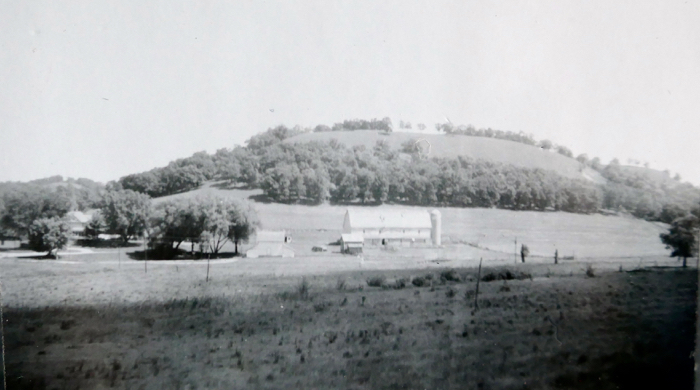 Here’s an earlier photo of the house and barn and Sumac Bluff – from their cousin Dale Rutschow – that was taken sometime in the 1920s or 1930s. There weren’t nearly as many trees on Sumac Bluff in those days. 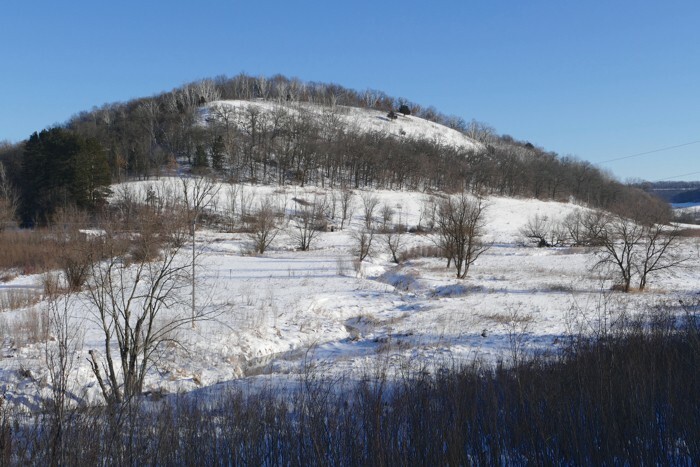 Here’s a more current photo of Sumac Bluff – taken last winter. Click HERE to see more about Steve and Margaret’s visit, and more old photos of the farm. There are still a few butterflies flying around on sunny days. 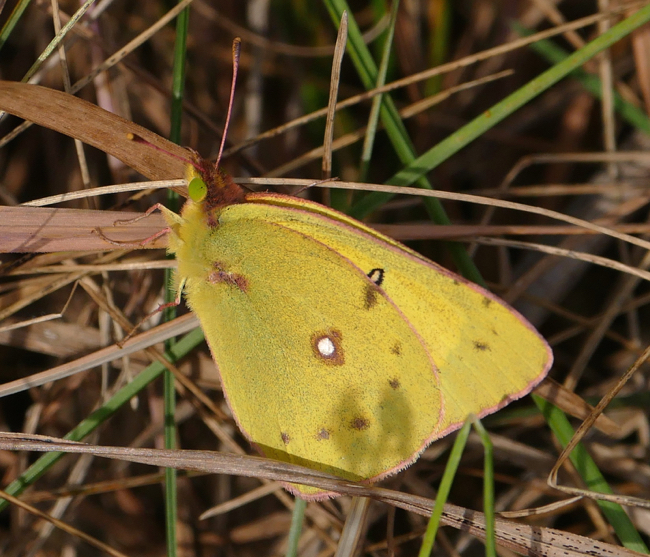 This is an Orange Sulphur. And there are still some very late flowers blooming. 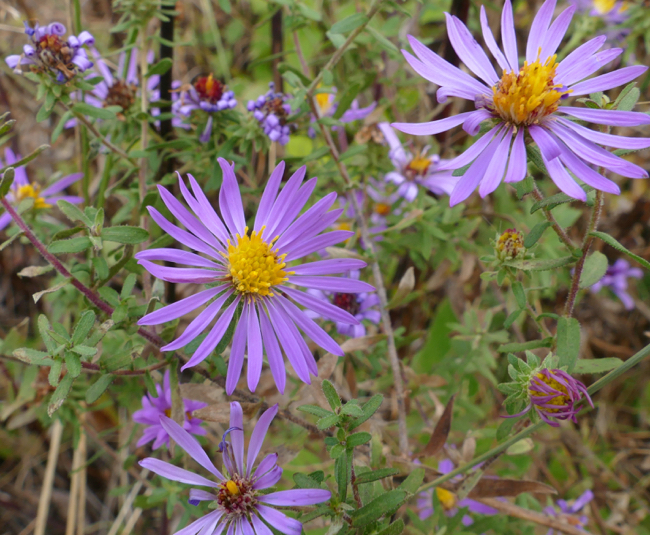 Here’s Aromatic Aster in one of our planted prairies. This plant has lots of common names – my favorite is Tinker’s Weed. 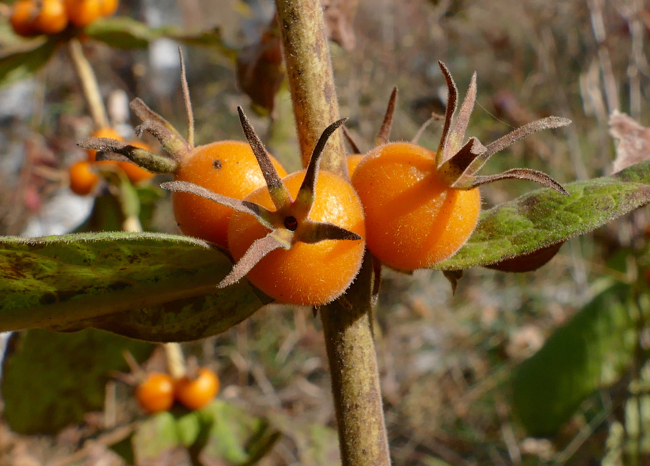 It grows well in our restored savannas, and gets these bright orange fruits in the fall. 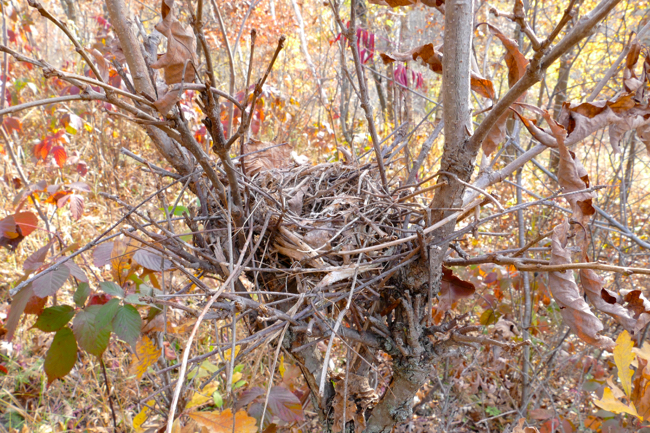 Now that the leaves are falling off the trees, it’s easier to see bird nests. We’re working on several different fall/winter projects. Here I’m planting prairie seeds on an old hay field. 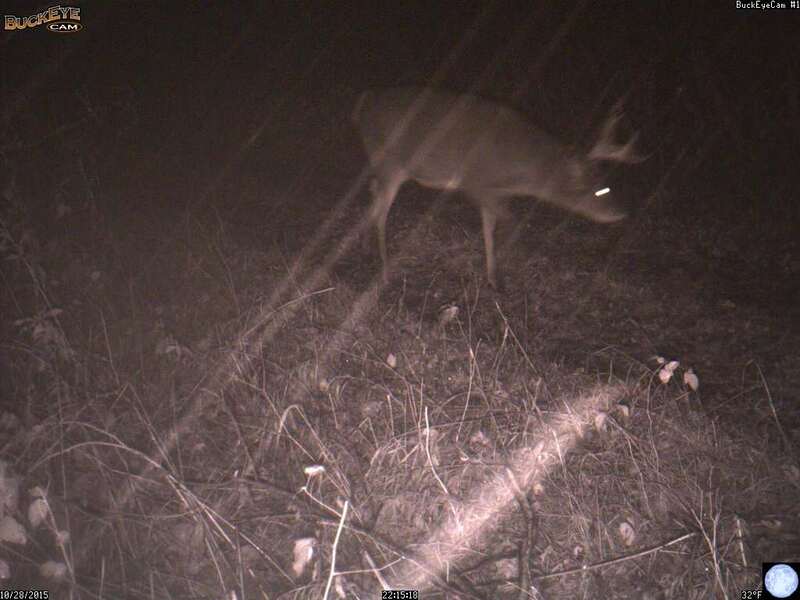 We had it sprayed a few weeks ago to kill the weeds. Now I’ve divided it into sections with stakes, and once the snow comes, I’ll broadcast the seeds on top of the snow. 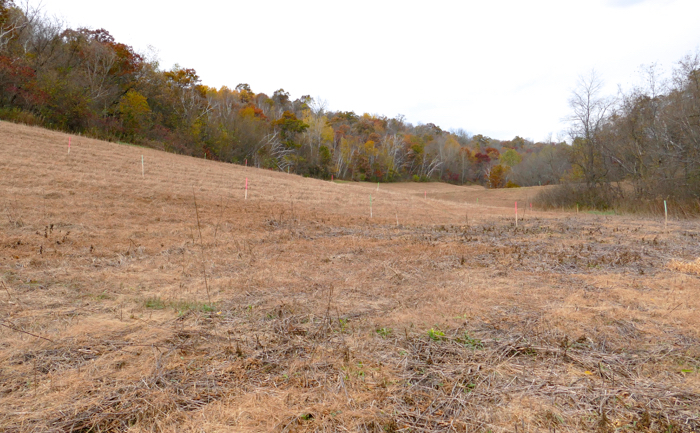 This is a newly cleared savanna. 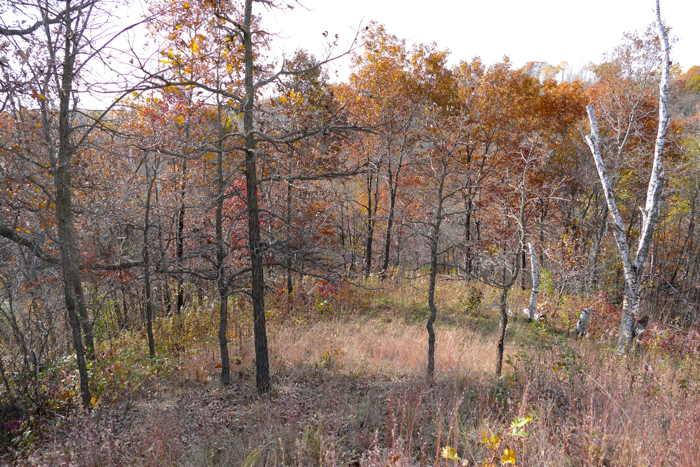 It was a very brushy, overgrown woods just above Big View Prairie – one of our larger remnants. Small Burr Oaks grow on the flat top of the bluff, and huge old ones on the slope below. I did a little hand cutting and clearing, and Mike did some mowing. We hope to expand the open area next year. 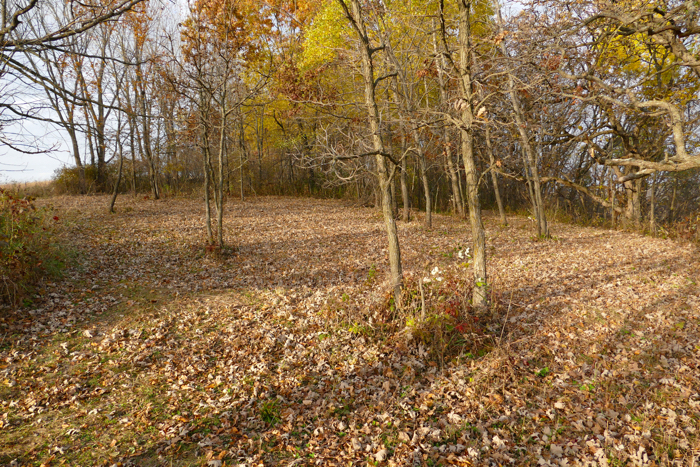 This is a ‘before’ photo of another of our clearing projects – on Hidden Oaks Point. 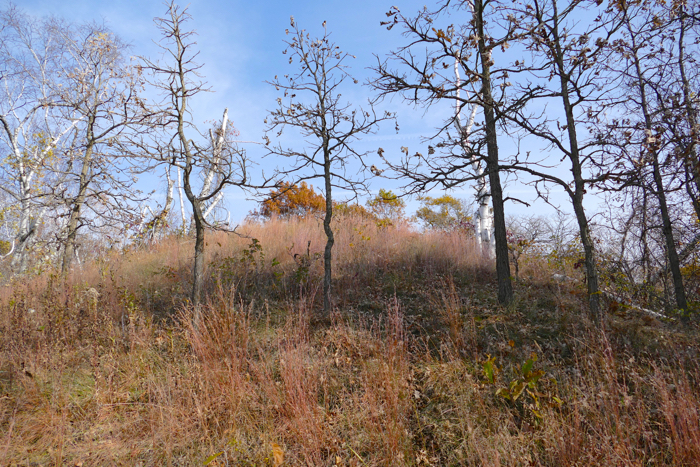 We’re clearing out the small brush and trees so the savanna will come back, and we should – eventually – be able to see all the way from the top of the point, down into the valley. 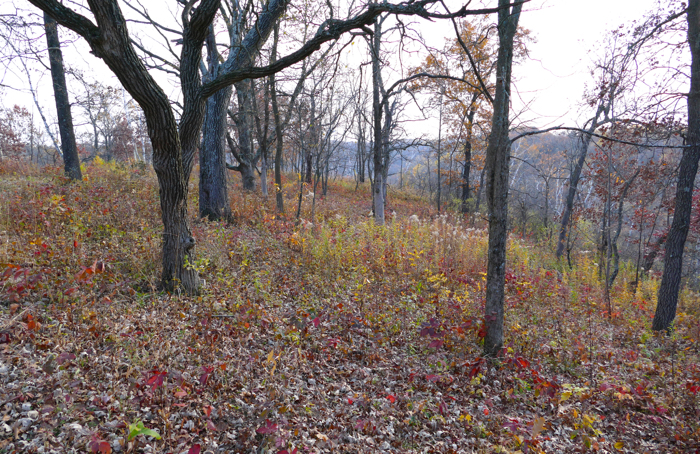 This is a view the other way – back up the hill toward the top of Hidden Oaks Point. And looking from the savanna on top of Hidden Oaks Point, south across the prairie point. 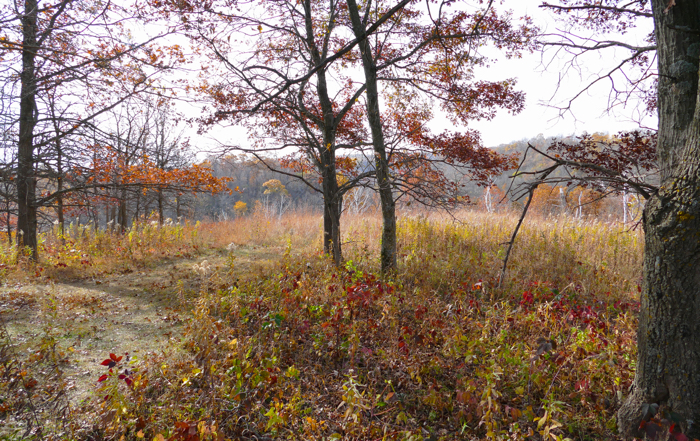 This is a fall project from a few years ago – savanna clearing on Indian Grass Point. I’m still working on clearing some of the smaller trees, and we mow it every spring to discourage the brush. 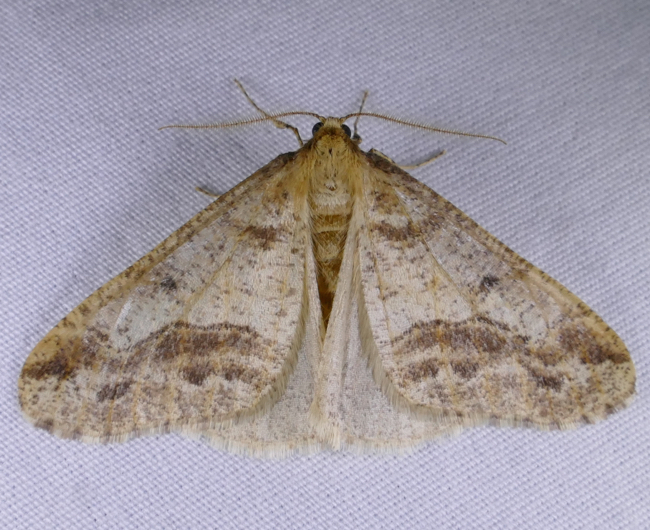 Moths are still coming to my bait, although there are fewer now that it’s colder. 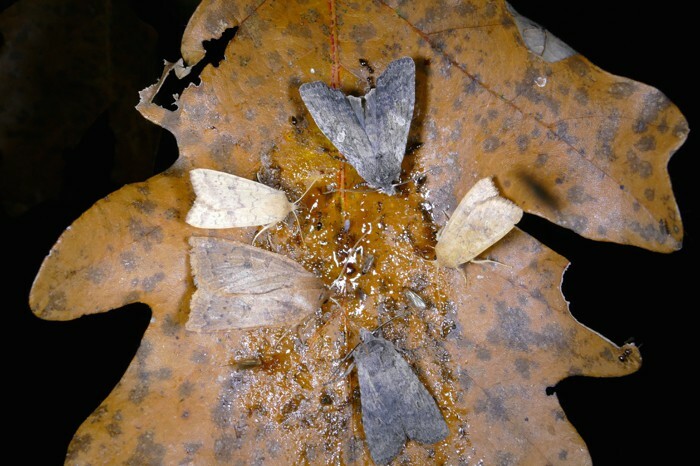 They especially like bait painted on leaves. This is Bethune’s Pinion – a more brightly colored specimen than I usually see. 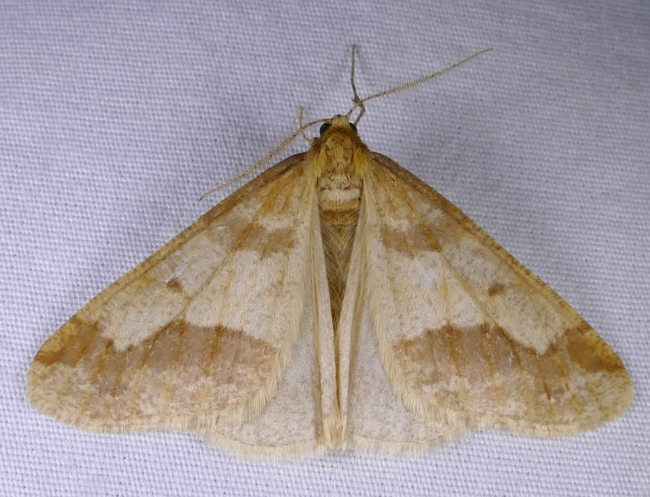 A male Linden Looper. I see dozens, sometimes hundreds of these every year. 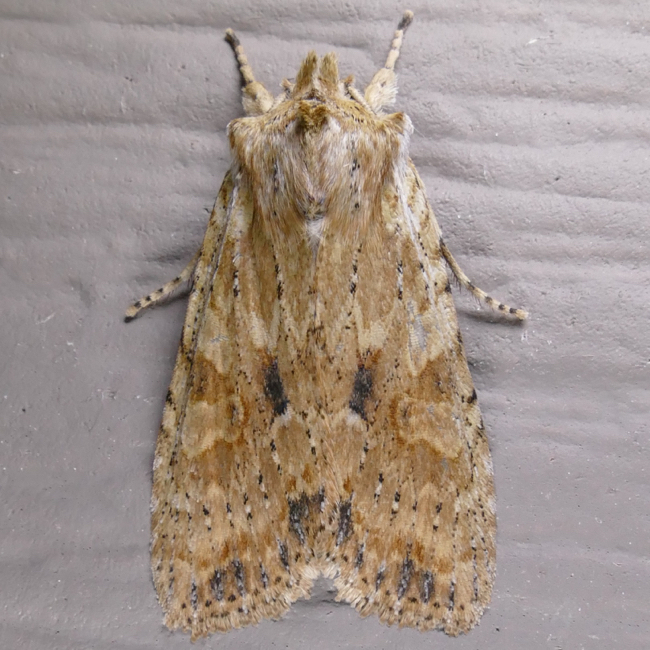 A few nights ago I had 55 individuals around my lights and on the walls of the garage. On very warm nights I’ve had as many as 150. 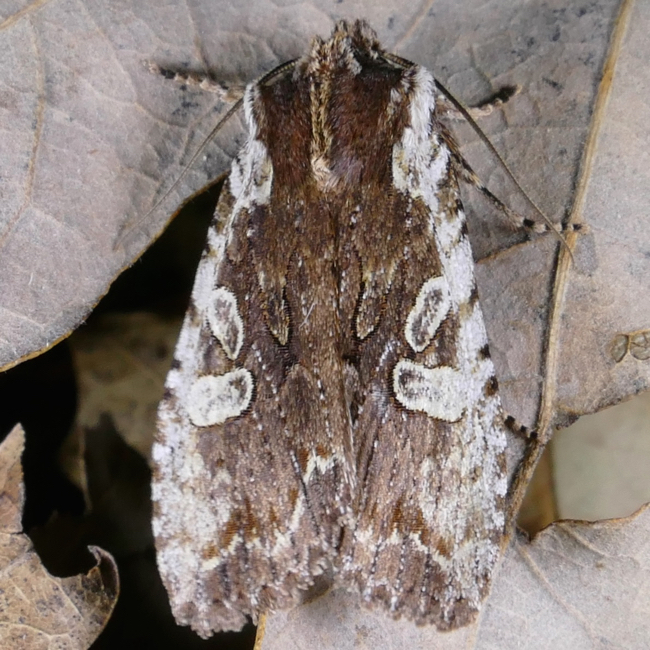 Only the males have wings – females are wingless, and I’ve never seen one. 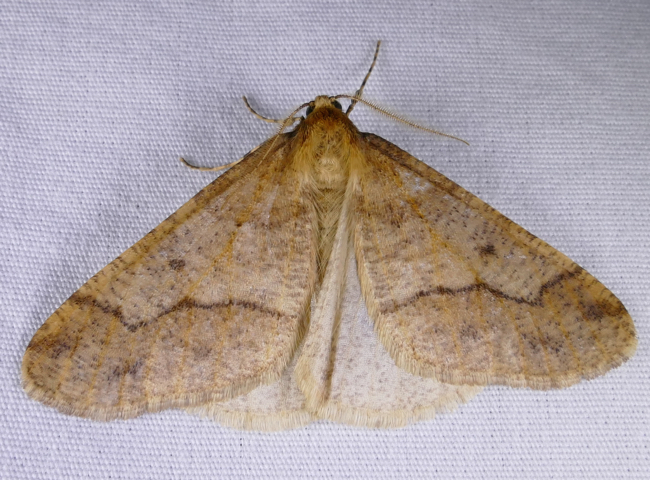 Another Linden Looper – the colors and patterns of the wings are different on different individuals. 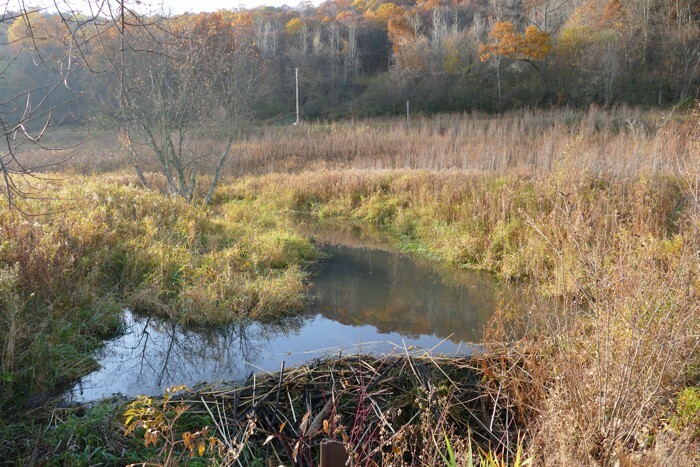 The beavers have been working on enlarging their pond for the winter. 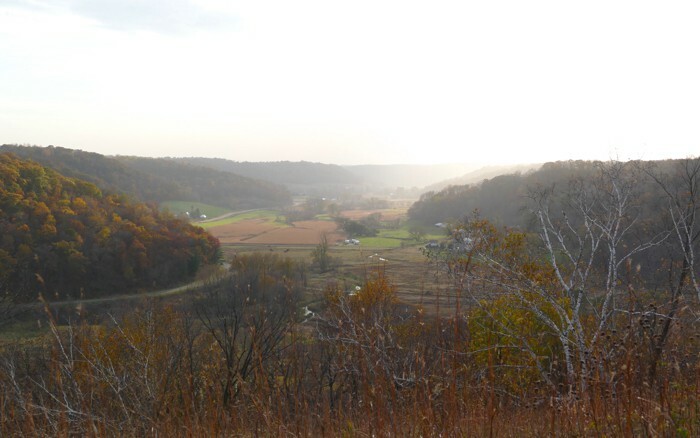 Praag Valley on a hazy afternoon, from Big View Prairie.